It’s another super healthy recipe coming for us! But nothing new here, I’m still drinking green smoothies all of the time, but I am trying some new add ins to up the nutrition and boost my immune system. I’m a creature of smoothie habit, making it basically the same way over and over, even if I love all the smoothies I drink with other ingredients. But recently I drank a juice at a super healthy eating restaurant in Portland that reminded me of a cleanse I did in my early twenties. It has apples, lemon, cayenne, spirulina, and ginger. Have you seen that cleanse? It was super popular fifteen years ago, and I tried it for a day or two, and went right back to real food. Last year I made a berry beet smoothie that I loved, so I decided to add beets! They are full of vitamins and taste great with the sweetness of the apple, and spicy ginger. I ordered this drink and it took me right back to that time in my life, I did cleanses more often then and I was a massage therapist, it feels like that was a lonnnnggg time ago. It’s so so easy to add things to our daily green smoothie habit to up the nutrition, like ginger. I use the Gourmet Garden paste to make my life and smoothie add ins easier. Same goes with the spirulina powder, it’s kind of a no brainer to keep these things around. I am making more of an effort to take care of myself, not only by eating healthy and balanced as I do normally, but making simple changes like this. On my monthly tv segment last week I told millions of viewers I did five pushups, because I did! I could only do five, no shame in my game, they are challenging. Well, today I am happy to report I am up to twenty, BOOM! Making these small changes like adding ginger to a smoothie or having a push up goal is how I am taking care of myself. What are your ways you take care of yourself? I’d love tips to your favorite ways! Place all ingredients into blender. Blend on high for a 3 minutes, or until all ingredients are combined well. Store in mason jars with tight fitting lids, or covered glass in fridge for the next day. I double the recipe and have smoothies for the next two days. 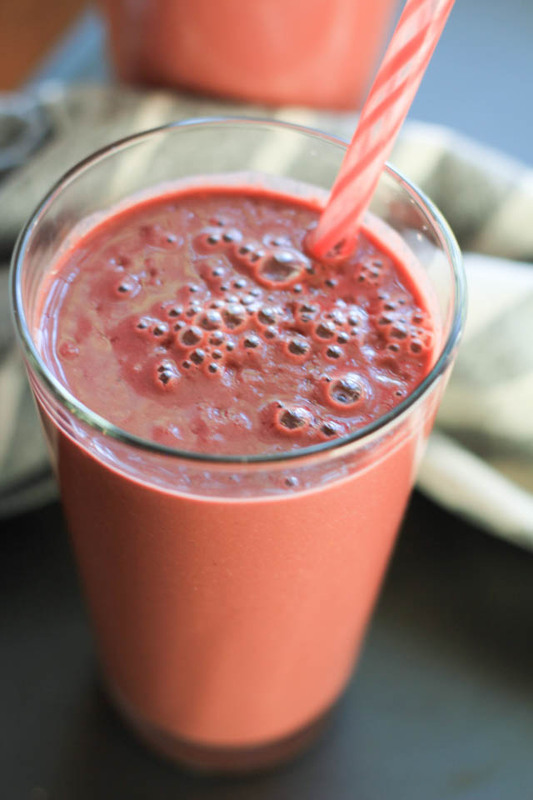 This is my dream smoothie – so rich in flavors and nutrients. I love beets and ginger but often find them potent together. Apples and spinach are great ways to soften their intensity. A must try! I love adding beets to my smoothies – they’re so delicious! Using the Gourmet Garden ginger paste is really smart too. I cook with those all the time, but that’s so easy for a smoothie. That is great! I have beets on hand to pop them in smoothies when I feel I need them. What a great use for the Gourmet Garden Ginger! I looooove beet smoothies. The earthy sweetness works so well in a breakfast beverage. I could not agree more! I love the earthiness, it feels like uber health to me, especially with the GG paste! This is beautiful! I love apple and ginger together, but I’m not so keen on beets even though I know they are good for you. I bet I would love them in this smoothie though! I totally understand. I used to not love beets, and now I eat them regularly. Although I am not sure you’d like them even in smoothies lol. But for sure try it! Maybe add an extra banana or mango for sweetness. What a lovely combination of flavors. 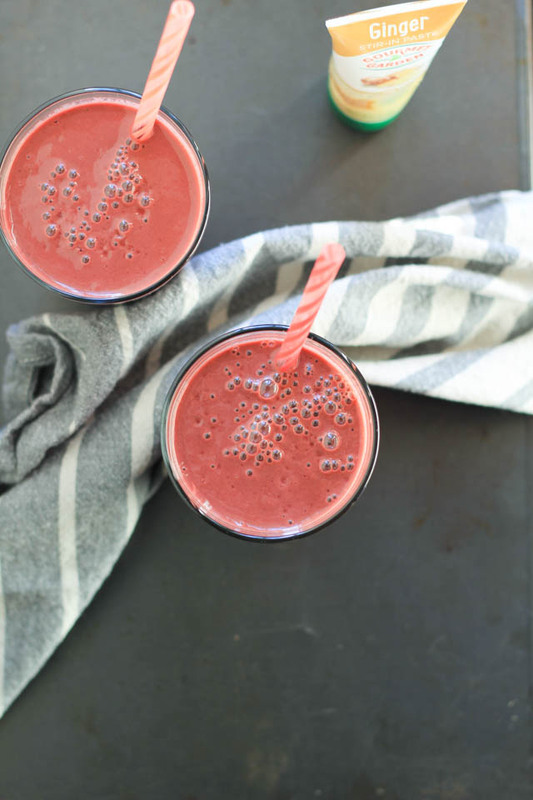 The beet definitely gives the smoothie a pop of color too, doesn’t it. What a delicious sounding smoothie! 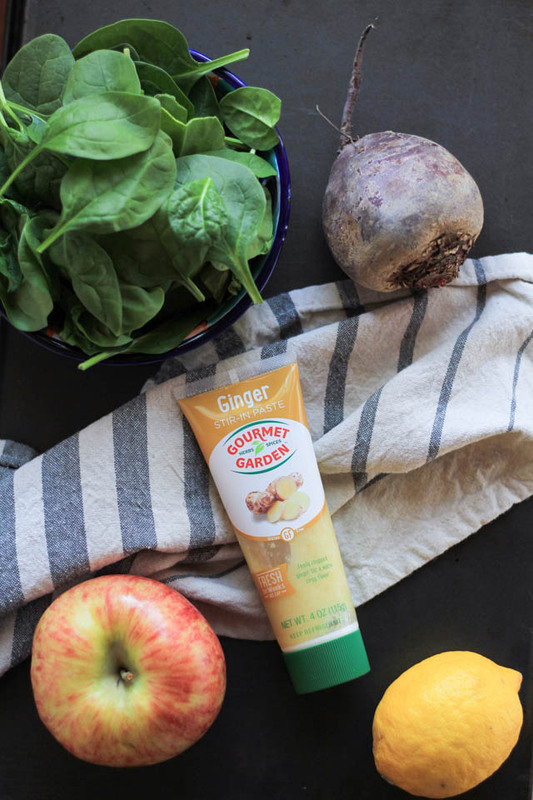 I love Gourmet Garden products but haven’t tried the ginger yet – looking forward to it! Super convenient for an extra added nutrient in smoothies! Hey there, 20-push-up gal! That’s seriously good progress! 😀 Let’s definitely chalk it up to smoothie power! What a wonderful twist here – not only with beets, but also the great flavor of ginger! And yes – aren’t those Gourmet Gardens products total lifesavers (and timesavers!) on busy days! Great post!! Lifesavers for sure. Ahhh thank you for the encouragement! Honestly when I started that week I could do 5, so 20 was YES!!!! I am going on 35 now and feeling great. It’s funny how flavors like these can work so well in a smoothie and boost our nutrition so easily. Sounds like my kind of smoothie, love the beet ginger combo! This sounds so refreshing… I have a cold right now and nothing has sounded good to me all day, but THIS is the ticket! I am going to have to go make one! 🙁 I hope you feel better soon. That ginger paste is a life saver, especially in smoothies! This sounds delightful! And what do you know? I have a couple beets in the fridge right now! Wow, I’ve never heard of this ginger magic! Such a great idea, especially using it in a smoothie! It is quite magical! You can find it in the herbs section at the store. I love GG’s ginger for smoothies! I love ginger and beets together! This smoothie will wake ya up in the morning! Super spicy to wake me up! I love Gourmet Garden Ginger and I have some in the kitchen right now that I need to use! So glad to have found this because I’ll be making these smoothies tomorrow morning! Thank you so much, I hope you like it! The ginger is nice and spicy!